Lincoln Electric (1994). 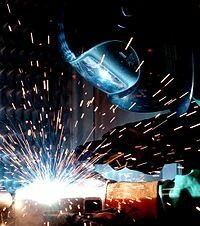 The Procedure Handbook of Arc Welding. Cleveland: Lincoln Electric. ISBN 99949-25-82-2. Weman, Klas (2003). Welding processes handbook. New York: CRC Press LLC. ISBN 0-8493-1773-8. หน้านี้แก้ไขล่าสุดเมื่อวันที่ 19 สิงหาคม 2560 เวลา 15:22 น.